The 45 revolutions per minute (rpm) adapter for records has much more of an interesting history than most assume. It is a small metal or plastic piece that is placed in the center of a 45 rpm record. The adapter allows for the record to be played on a turntable’s 78 rpm or LP size spindle. Some 45 rpm adapters are diminutive solid circles that slide onto the spindle’s bottom. Others are larger and fit over the full spindle. The 45 rpm was first brought to the market by the Webster-Chicago Corporation, sometimes referred to as Webcor. These inserts were comprised of solid zinc and somewhat difficult to connect to records. Removing them was nearly impossible without cracking the disc. Fidelitone soon created a 45 rpm adapter of a different shape. Unfortunately, this version was just as difficult to use. Capitol Records followed up Fidelitone’s 45 rpm adapter with a new version referred to as the Optional Center. Its name was usually shortened to O.C. 45. This version was comprised of a triangular cardboard insert along with a spindle hole that was about the same size as an LP. It was possible to punch out this adapter’s cardboard center to allow for playing with 45 rpm spindles yet it could not be replaced. RCA Corporation brought a new insert to the market known as the spider. This yellow and red plastic insert snapped in to allow 45 rpm records to be compatible with the comparably small 33⅓ rpm record player’s spindle. Thomas Hutchison created this device. His spider was quite popular during the 60s, with sales breaching the 10 million mark per year. The adapter was designed with little bumps known as drive pins that securely connected the adapters to one another during revolutions. This stopped the stacked records from slipping into one another. Fast forward to the 80s and Mark McLaughlan’s SX2 and Extender adapters were all the rage. McLaughlan designed and manufactured each while working as a DJ in Boston. He invented these adapters to facilitate the use of 7” discs when mixing for performances. The Extender was the initial design. It was made with a platter die-cut derived from plastic sheets. He bonded a lathe cut acrylic piece long with a foam pad. The SX2, also referred to as the Single Extender, followed. This adapter was created at Spirit, Inc. with plastic injection. The adapter featured a number of ridges along the platter’s underside to combat warping resulting from major alterations in temperature throughout the plastic injection process. McLaughlan also made use of a raised barrier to keep the head contained. The SX2 featured a polished surface within the barrier to reduce stylus damage. The SX2 ended up becoming quite popular amongst DJs throughout the 80s and beyond. 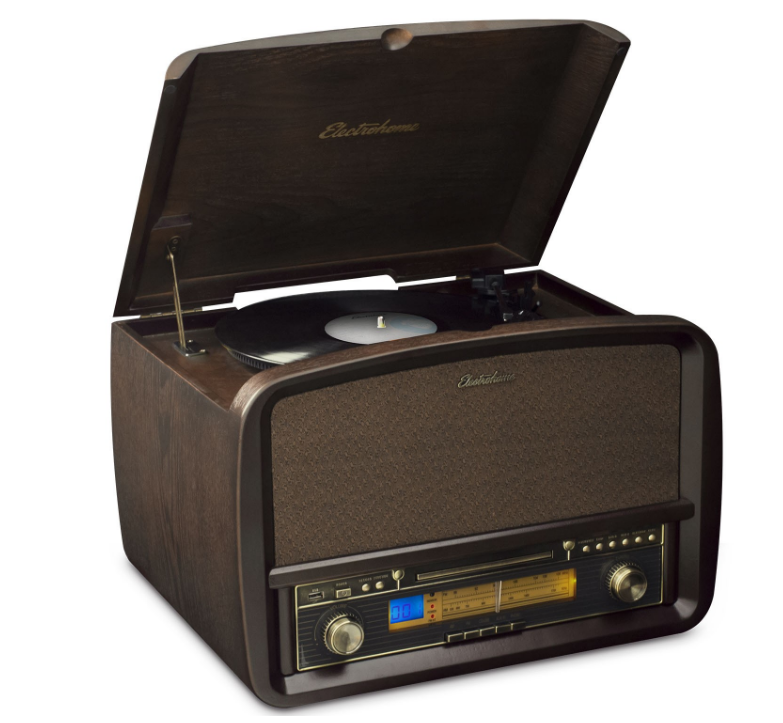 You can play all your 33s, 45s, and 78s on the Electrohome Signature Music System. Backed by over 100 years of manufacturing high fidelity audio products, Electrohome has paired the design of vintage record players with the technology of modern music systems.